If Rep. Alexandria Ocasio-Cortez, or anyone, attacks Ronald Wilson Reagan, it is fitting and proper for loyal Reaganites, including this one, to rise to the Gipper’s defense. As to AOC’s charge that Reagan was trafficking in racism, there’s been plenty of righteous pushback. For instance, Mark Weinberg, a former Reagan aide, and Craig Shirley, a Reagan biographer, teamed up to publish “AOC Lies: Reagan Was No Racist.” The co-authors recalled, for example, that back in 1931, college-student Reagan invited two black football teammates to stay in his home when they were refused admission to a hotel because of their skin color. And as for the specific issue of welfare, it is true that Reagan was a fierce opponent of welfare dependency—although of course, a lot of people were, and still are. In Reagan’s day, the public’s concern was heightened by soaring welfare rolls; in fact, welfare spending, as a percentage of GDP, doubled in the 1960s. And so in the 70s Reagan did, indeed, cite the egregious case of one Linda Taylor, who was convicted of welfare fraud and related charges and sent to prison for five years. This author worked for Reagan, in his presidential campaigns and in the White House, from 1979 to 1984, and so he likes to think he has a pretty good memory of that era, when Reagan was rescuing the economy, winning the Cold War, and appointing conservative judges. In other words, Reagan had lots on his plate; moreover, not every unhappy event from that era was his fault. First, midway through his presidency, in 1984, Reagan was re-elected with 59 percent of the vote, carrying 49 of 50 states; indeed, he was one of only two presidents in U.S. history to win over 500 electoral votes. Second, Reagan left office with an approval rating of 63 percent, the highest farewell number of any post-war president. We might further note that Reagan left office in January 1989, just 11 months before the Berlin Wall came down. That momentous—and peaceful—ending of the Cold War was a tribute to Reagan’s anti-Soviet policies, from aiding Polish union activists, to arming Afghan and Nicaraguan rebels, to launching the Strategic Defense Initiative. Thus it seems obvious: Reagan should be rated as one of our greatest presidents, alongside Washington, Lincoln, and the Roosevelts. So what’s going on? Why is criticism of Reagan gaining so much currency? Is it forgetfulness? Bad education? Or simply a case of ideology getting the best of reality? In other words, either we learn from the past, or we don’t. And if we don’t, well, we are at risk of making the same mistakes all over again. 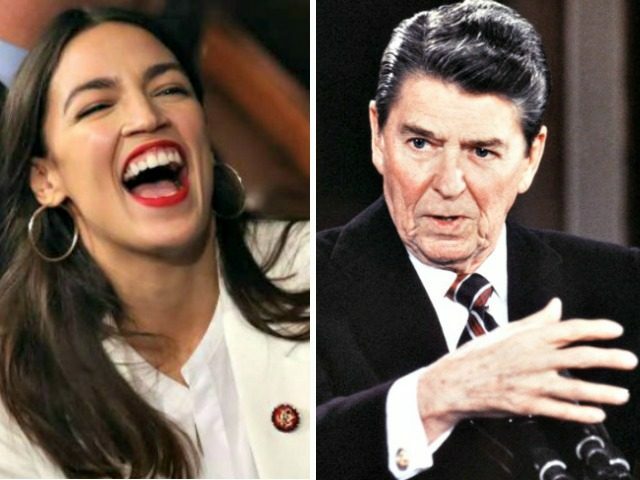 Today, 30 years after Reagan left office, and 15 years after his death, it’s evident that AOC and many in her generation are avidly embracing the sorts of policies that Reagan—and, at the time, the American people—rejected. To cite just one example, there’s the idea of a Universal Basic Income (UBI), which is welfare on steroids—and which is gaining support on the AOC-ish left. UBI is, to put it bluntly, a check for you, and me, and everybody, no strings attached, no questions asked. In other words, we don’t need to be a nation of welfare queens, and welfare kings; we need to be a nation of productive workers, gainfully employed. That’s good for the soul, good for the economy, and good for the nation. For the time being, UBI is just an idea—an idea that’s been tried in a few places, and rejected. Yet it’s possible that after the 2020 elections, we will be once again be led by those who think that the welfare surge of the late 20th century was a good thing, not a bad thing. And if so, then we’d better hope that we get another Reagan, to save us once again.